What impact does alcohol have on health? Drinking too much – on a single occasion or over time – can take a serious toll on your health. Alcohol can have on impact on the heart, liver, pancreas, and immune system. Alcohol use has also been associated with several different types of cancers including cancers of the mouth, esophagus, throat, liver, and breast. Find our more about how alcohol impacts health at NIAAA's resource Beyond Hangovers: Understanding alcohol's impact on your health or CDC's Alcohol Use and Your Health infographic. A standard drink in the United States is any drink that contains about 14 grams of pure alcohol (about 0.6 fluid ounces or 1.2 tablespoons). 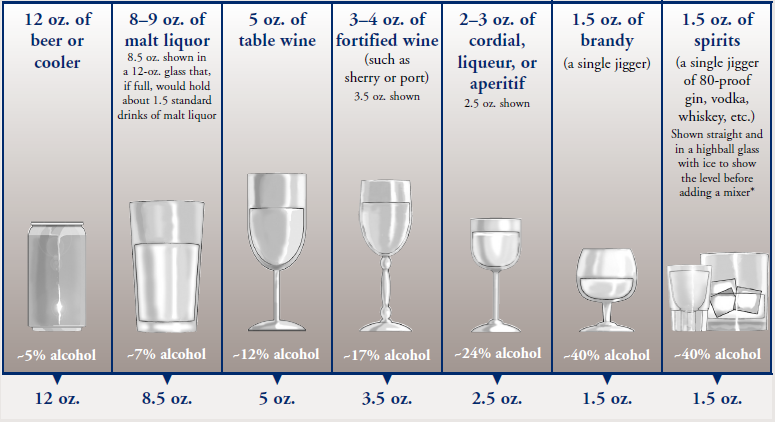 Below are U.S. standard drink equivalents. These are approximate, since different brands and types of beverages vary in their actual alcohol content.